Norfork Lake's summer fishing pattern is showing signs that it is starting to change. Typically around beginning to the middle of September the striped bass move from the south end of the lake and scatter thoughout the lake with a tendency to move up river to the cooler water. This year appears to be a little different to prior years. The lake has great oxygenated water down to and a little past the thermocline and then the oxygen level drops to a very low level. This is keeping all species of fish above 40 feet with most concentrating around the 30 - 35 feet level, regardless of the water depth. The lake surface water temperature has cooled off a bit and currently is in the low 80's down from the 90 degree water temperature of a week ago. I am sure the cooler water is a big relief to the striped bass as they prefer temperatures in the 60's and low 70's. 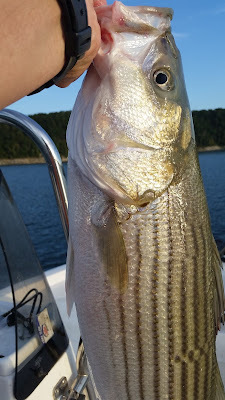 Because of the change that is occurring, I am starting to find feeding striped bass up in the mid to northern parts of the lake which is a little earlier than normal. Two weeks ago I was fishing the south part of the lake with my granddaughter using thread fin shad and we were limiting out most days with stripers and hybrids. 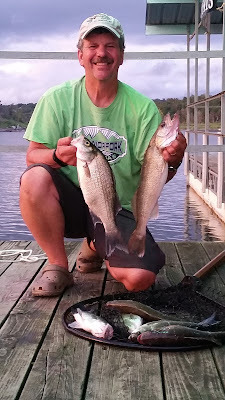 After she went back home, I changed my tactics and have switched from live bait fishing to vertical jigging with a spoon and to casting lures for largemouth bass. I have mainly been fishing within 6 miles in all directions from Hummingbird Hideaway Resort. My best bite has been in the late afternoon. I am finding large schools of fish feeding in 25 - 35 feet of water mainly on large flats. If you find the bait there will be fish not far away. The south end of the lake continues to be very productive for striped bass early in the morning with live bait in the same 30 - 35 feet of water. 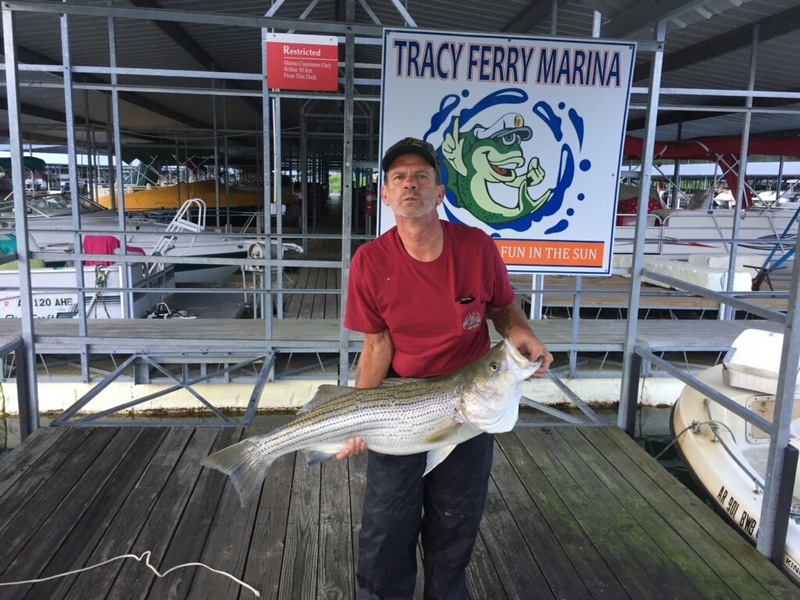 Look for stripers off of points within 0 - 2 miles of the dam and you should find some nice fish. The walleye, white bass, catfish and spotted bass bite has been improving and I am finding them in the same type of areas as the stripers and hybrids. One great thing about vertical jigging with a spoon is that they will catch all species. Yesterday I caught every species int the lake except crappie by vertical jigging. I also like to horizontal jig by casting out a Kastmaster type of blade bait, letting it sink to the bottom then jerk it back to the boat bouncing it along the bottom. I have used my spoons the same way, but have had more success with the blade type baits. I have caught most of my walleye using a 3/4 ounce spoon, but instead of vertical jigging I have been moving slowly with my trolling motor and dragging the spoon along the bottom and jerking it as I am moving. Most times they attack it as it hits the bottom after a jerk. 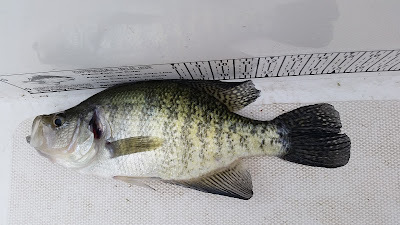 Crappie appear to be scattered out on the same flats as all the other fish. They have not moved into the brush as of yet, but will do very soon. I am picking up a few while jigging my spoon and the ones I catch have been the 15 + inch monsters. I am also picking up some nice largemouth mixed in with all the other species in the same areas, but have had more luck on rocky points going into a creek or cove. Most of the fish I have caught have been suspended 10 - 20 feet down and a wiggle wart has worked great for me. I have also found some sporadic top water action and used a Zara Spook puppy since they wanted a smaller bait. For you night time bass fisher people, work the bottom with a jig and pig along the bluff lines or use a tube jig or dark spinner bait by docks after dark. Lake Norfork level is rising very slowly and currently sits at 554.29. Minimal power generation is occurring to allow this rise. The lake surface water temperature has fallen to around 83 - 84 degrees, but I am sure it will rise once the air temperature warms up again. The main lake is clear with the creeks and coves stained.